Home » Interesting Discussions » Your Say: Do you still comment on blogs? 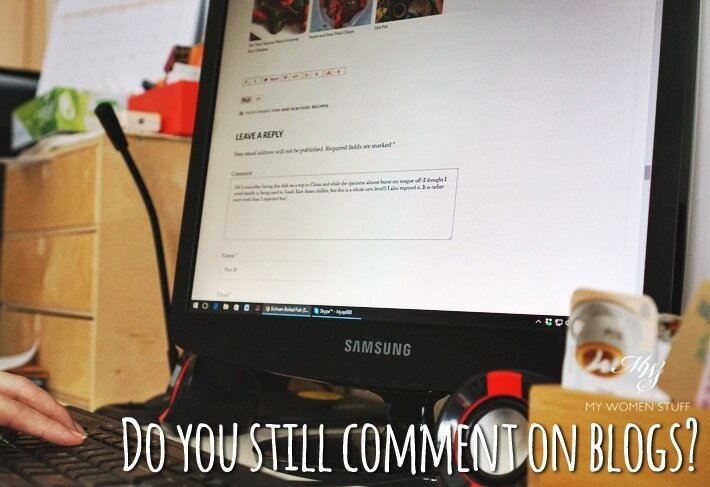 Your Say: Do you still comment on blogs? You know, the blog has been feeling rather intense lately. I think it’s that last giveaway and celebratory post and my whacking of Luna that’s stirring up a lot of feelings haha! (but thank you for your input, you guys are really the best!) So I wanted to chill things down a little on the beauty front and ask you something prompted by a question I came across on Twitter. Blogging friend Arianne of The Glitter Geek asked on Twitter if you or does anyone still comment or would comment anymore on blog posts, or if your preferred medium of interaction is social media e.g. Instagram, Facebook or Twitter (the 3 most common interactive social media platforms for this purpose). Curious Q: do you comment on blogs anymore? Do you just engage on the social platforms linking to posts? Admittedly I mostly do the latter. I thought it was an excellent question, because it’s one I have been thinking about as well in recent times 🙂 I’d like to invite you to talk about this, because I think it’s interesting to see how commenting has evolved (or devolved). From a blogger standpoint, I do like leaving a comment on blogs and I try to whenever I can. This is particularly so if it’s a blog post or topic I feel strongly enough to leave an opinion, or if I’m sufficiently moved to leave a long comment. It’s a hat tip to the blogger for their hard work (because I know how hard it can be) and it serves as encouragement. On friends’ blogs, I would comment regardless, because they’re friends and I like to show a little support, and it’s always a good place to engage in some light-hearted banter 😀 Sadly however, many of my friends no longer blog so I don’t engage as much as I used to. I also like leaving comments, because I know how it feels, as a blogger, to slave over a blog post, thinking “This is the one! I just know this is going to be an epic post because I have such a strong opinion on it!” … and then hear crickets and see the dreaded “0 Comments” on the post. For old-timer bloggers, comments were, and still are, a way to validate our existence. Just stating facts here! 😛 But I can tell you, from a blogger’s standpoint that blog comments aren’t as active as they used to be just a few years ago. I attribute it to the rise of social media. Quite often, I find that sharing a view on Twitter or Instagram gets me a response more quickly than it would, had I left a comment on the blog. Also, with blogs, you’d have to check back to that specific blog post in order to see if there’s a response, unless there’s a system in place to notify you of replies to your comment. Unless it’s a topic you feel strongly enough about, the odds are, you’ve moved on. Also, some bloggers don’t reply to comments. I understand that for some, the volume of comments they get daily can be overwhelming, so they may not respond to every comment. And that’s the risk you run, as a reader. That said, I too find that on social media, some bloggers don’t reply or respond to comments, or more importantly, questions either. I do get that responding to every comment that says “So cute!”, “I love it!” or “Love this outfit!” is trite and non-productive, but I do think that replying to a question is good manners. However, I also understand that sometimes, comments and questions get buried in the feed, especially if they are very popular personalities. It happens to me sometimes (although I’m not a popular personality LOL! ), and for this reason, I prefer questions asked in blog comments because I can come back to it to respond, and there’s no excuse for it being buried anywhere. It’s there, on your dashboard. But I get that social media is more interactive in that sense. It gives you a sense of immediacy and connection to the person. I also find that people are more willing to interact with me on Twitter or Instagram – perhaps it’s just quicker because you’re already signed in and can tap off a comment on your phone. Perhaps it’s more personal. A blog can often feel a little more faceless, lacking that immediacy of response, and the forms you have to fill BEFORE you can comment can turn some people off, as many people now read on their mobiles and most people are just impatient. What say you? Do you comment on blogs anymore? Or is social media your preferred method of engagement? p/s Just an addendum: I’m not really speaking about my blog per se nor seeking validation – hope it’s not being misunderstood! 😀 This is a general observation based on my conversations with other bloggers and also my observations about what I see on other blogs. It’s a phenomenon that’s been recognised by some “pro-bloggers” as well who blog about blogging, tech and SEO so it’s not limited to just my blog – but to blogging in general. Yes I occasionally comment, particularly if the topic is something I’m interested in and feel that I can contribute/respond to the blogger. I sometimes also ask question through the blog but not every blogger gets around to answering my question ? but I agree that I comment more on FB and Instagram instead of blogs. It is faster (to get noticed) and easier too. Helloooo! Interesting topic! I don’t normally leave blog comments on those blogs that apparently get paid to advertise product launch or something. For instance, I won’t ever leave a comment in Temptalia’s blog posts. Never ever in a million years. I think blog comments are a little bit private… it’s like a small private chat forum for people with similar interest in the same thing (a particular blog post) to discover new things from each other. I also like the fact that you don’t need to “like” a blog comment. Comments are not a competition for how many likes you get. Also… maybe I am getting old. Those social media updates are too much and too fast. I can’t catch up as I don’t check my phone all the time. So I read blog posts because it’s there when I want to read it or refer to it later. Lastly, I only comment on your blog post, and Lily’s mostly. And woks of life too. They are good. Tried a couple of recipes from their site and oh i keep going back. Ok now I am distracted. I comment when i have opinion on something. But if the blogger dont bother to reply to any question etc, i would never comment on their blog again since they dont bother to read my comment. I feel you Peggy! It bugs me especially if I ask a question and don’t get a reply. If it’s an old post, I can kind of understand (because sometimes, it’s not worth replying to comments on old posts that may not be relevant anymore) but if it’s a recent post, it’s unforgivable! Thanks so much for bringing this conversation to your blog, Paris. I love reading the comments here and learning more about the motivation for commenters and silent readers. I wholeheartedly agree with everything you say here. Conflicted as a blogger. But also, lazy! I do find that as a blogger, I feel slightly coerced to reply to social media comments, and on my blog, I feel like I have time to comment (and most of the time, never do). Maybe because I feel I have to craft up a long response to those who take time to comment and not just, “thanks!”. You know what I mean? The dreaded “0 comments” though. Ugh. Thank YOU Arianne, for prompting the discussion in the first place! A good example of social media meets blogs 😀 I absolutely get you when it comes to leaving comments, as a reader. Sometimes, by the time I KIV the post to comment on later, I may have forgotten or something else has come up. I do find it harder to comment on platforms that require a sign in, but I can understand why people use it, because of the discussion and response it gives. As a blogger, we want to make things easy for everyone, and we want the comments. As readers, we can be lazy. It’s complicated haha! Honestly, I noticed that as social media platforms evolve, people’s attention span has been getting shorter than before. Most people want info quickly and that said, I believe a lot of people are moving away from blogs because they require longer time to read etc, unlike for e.g., Instagram. However, your blog is one of the very few blogs I still follow and to be very honest, I only comment on yours because you always ask question at the end (in other words, I also don’t feel thick skinned to comment with my opinion since you asked :P)! I also remember reading somewhere on your blog that asking questions is one of the ways to engage your readers hehe. Well done haha! I am a silent reader (and this is my first comment on MWS *waves shyly* ) but if I have a question or two or feel strongly about the posted matter, I’d gather the courage to type a sentence or two.. I don’t usually comment unless I have something of value to say or a question to ask. I much prefer responding to you after reading your e-newsletters! Maybe I’m just a more private person la, haha. Btw, I love The Woks of Life! Have tried a few of their recipes like the buns and the dumplings which are now a frequent addition to the dinner table. I don’t get to cook much but I love browsing through cooking and baking blogs. Very relaxing but usually makes my stomach growl. Heh! I rarely comment on blogs these days. I just don’t have time. It was easy to do when I only had to write a piece and hit publish, but today there are so many other things to do. Leaving comments just isn’t a priority anymore. I’ve noticed a decline in comments on my blog, too, but I still get a decent number every month. And you know what? Their quality has become better. Whereas before I attracted a lot of bloggers saying “great post” or “love this lipgloss” just to get some traffic back to their blogs, these days, it’s mostly genuine readers who leave a comment. Most of them are questions about skincare on my tips/ingredients posts. Instead, almost no one comments on reviews anymore. I guess these rarely spark a reaction and there’s not much people can say, apart from “sounds awesome, can’t wait to try it!” if they haven’t used the product themselves. As for social media, I’m the odd one out. I don’t like it. Never have, never will. I reply to every comment on my blog, but I rarely see comments and mentions on social media so they almost always go unanswered. Maybe that’s bad but I prefer to interact with people on my blog and email newsletter. Yes, fewer people engage with you that way, but that’s why those are your most loyal followers. I’d rather spend my time creating a relationship with them than replying to some random person on Twitter I will never talk to again. And yes, people these days have shorter attention spans. But, everyone takes the time to read, and maybe even comment, on a long article, if it something that deeply interests them. In the end, quality will always trump everything else. I may have gone off on a tangent here, but my point is this. As disheartening as it is to receive fewer comments, it’s not necessarily a bad thing. It’s much better to receive fewer but better quality comments from people who truly care about what you do than plenty of meaningless comments. Remember how we used to complain that most comments were too short and left just to drive traffic back to someone’s blog? Create valuable content and people will engage with you in one way or another. Even if they have short attention spans. Even if they have to type on smartphones. Even if they are shy or busy and only leave a comment once a year. Even the most silent or busy reader will come out of the woodwork once in a while to thank you or leave a comment if they truly enjoy what you have to offer them. So many comments on this post are proof of this. P.S. Congrats on 10 years of blogging. Keep up the good work! Thanks Gio, and I think as many of us grow and evolve and especially as we gain more responsibilities in life, it’s quite natural that we slow down on commenting on other blogs. In fact, I struggle to keep up with my blog reading these days, so I actually block-read whenever I can find some time. To be fair, I never really had a problem before about people commenting for the sake of links. I think it’s because I’d delete their links all the time LOL! But you are right about quantity vs quality. I too would rather have quality comments or insights than just mere mass. Social media is, I feel, interesting. 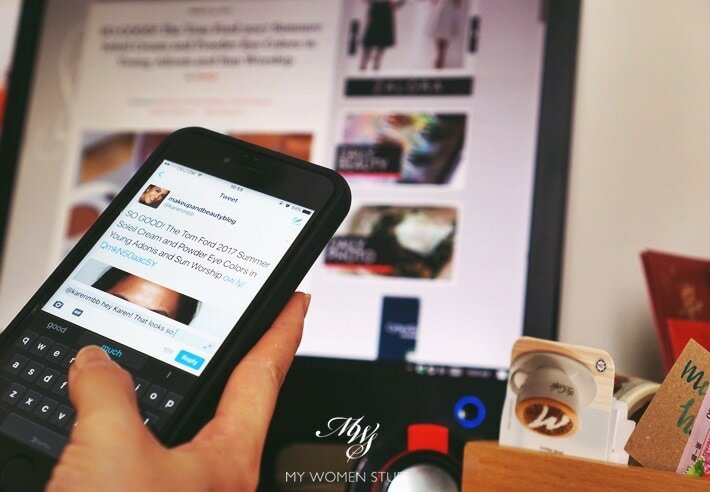 I only use Twitter and Instagram and I find their dynamics quite different, but both have their charms for me and people do tend to be more responsive, as I guess, it’s more personal to “talk” to a blogger as opposed to leaving a comment on their blog. That said, it could sometimes just be about the subject and how it resonates with readers 😀 Thanks for sharing your thoughts Gio. I see you’ve been doing well in London – that’s good to know! I do comment on blogs, but only if the blogger him/herself actually DO reply back on my comments. It actually gave me a sense that a real communication is going on and yeah, that’s what blogs are for. Absolutely Angie! Conversation is a two-way street, not just the blogger spouting off on their soapbox, or the commentators rabble-rousing below LOL! I love this question, especially because it invites me to share my thoughts. I’m late to the party with blogs, having been in school for so many years and in a ridiculously demanding line of work. Now that I have a bit more time on my hands, I’m discovering them and often feel compelled to post a comment, even if the entry is several years old! I’m old-fashioned like that, though. I still (gasp!) write letters to people. I generally don’t get a response from most blog authors (or my letters! ), but there are a few who respond right away and I love that! Blog entries are still relavent because the entry will be indexed in an easy-to-find manner on a blog-site as opposed to Facebook, where an entry will get buried. It also may be confining for the blogger in its format unless they just want to have their entry on their website and leave the comments sections for social media posts. Blogs also allow for the author to share, in their own preferred format, their adventure concerning their subject matter and creativity with how they use their photographs. I enjoy seeing each blogger’s unique spin on things. Of course it would be disappointing to discover that people no longer commented on one’s blog. I guess it would then be up to the author to look at the number of visits their blog entry gets vs. the number of visits their social media entries get. Whatever the case, I hope it becomes simpler for the blogger. Managing so many things – FB, Twitter, and the blog entry itself might get exhausting, to say the least! It takes a detail-oriented and patient sort of individual to undertake these things! It didn’t sound at all like you were ready to hang up your blog format, which makes me happy, as I’ve just discovered your lovely blog when looking for information about Guerlain’s Météorites. Whatever you decide to do, however, your readers will understand. You’ve got a devoted following and they will follow wherever you steer your ship! I don’t comment as I did years before, but we all know that I’m not the only one; I still remember blog post with more than 30 comments before the author answer them. But as you say and as I said to Arianne, for me is easier to get in touch in social media, mainly because when I write in a blog post is because I have a big question or opinion so I know I’ll write a lot. In addition I must admit that I prefer to write comments in blogs I’ve read for many years rather than in new ones for me; also if I know the author replies to all the comments I’m more likely to leave a comment. I hear you Efrain 🙂 I sometimes am just as guilty of taking my time to reply and before I know it, 2 weeks have gone by LOL! I don’t mind when people connect on social media, but sometimes, my answer is too long and that’s when I wish they’d just leave a comment because it’s helpful to someone else too LOL! But you are right. Like all conversations, it’s easier to get involved with someone you “know” as opposed to a new blog or blogger who you may not know. So often, I’ve left comments or asked questions only to get no answers. It’s frustrating. I do comment on blog posts if they make me feel something, AND usually if the blogger in question is engaging with me. I may be old school, but I do like engaging and small conversations, not just commenting to put my presence there (uughh!). Congrats on your 10 years by the way! Good on you!!! Thank you Sofia, for your well wishes and your comment 🙂 I know what you mean about wanting to make yourself be seen. I’ve seen many bloggers do that, every time they publish a new post, in the hope that it’ll lead traffic back to them. I don’t mind if it does – sharing is caring, but it bugs me that I never hear from them if there’s no new post! LOL I’m as old school as you are – blog comments are for conversation! I follow a few blogs, and yours is actually the only one I comment on. The rest I’m just a silent reader. But actually, a lot of the time I don’t comment on all your posts. If anything, I’m more social and active on my instagram. For instagram it’s easier to follow someone and chat with them vs going on their blog. I’m already on my phone and everything is basically conveniently located in one app.